A second person was also arrested they said, although that person’s identity and connection to the incident is unclear. Utrecht police had asked for the public’s help in finding Gokman Tanis, the 37-year-old believed to be connected to the shooting. 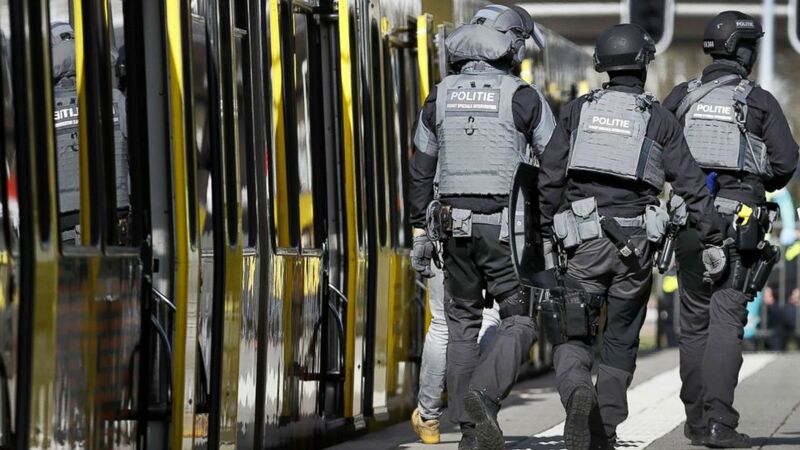 (Robin van Lonkhuijsen/AFP/Getty Images) Police forces walk near a tram at the 24 Oktoberplace in Utrecht, March 18, 2019, where a shooting took place. On Monday morning, Utrecht police said on Twitter they were investigating a shooting, adding that a “possible terrorist motif is part of the investigation.” The shooting happened around 10:50 a.m. local time. The Dutch counterterror office raised Utrecht’s threat level to maximum, according to The Associated Press.